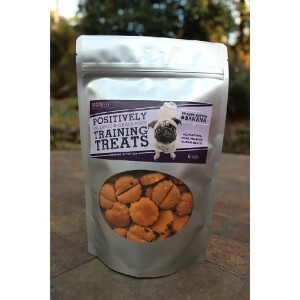 “What kind of treats does Victoria use when training dogs?” This is one of the most often-asked questions Victoria receives, and now you know: Positively Training Treats! Finding high-value ‘jackpot’ rewards is one of Victoria’s keys to successful training using positive training methods. These all-natural, 100% organic treats are hand-pressed from locally-sourced, grain and gluten-free natural ingredients to create the ultimate training treat. Easily breakable into smaller pieces for training, these delicious allergen-free treat biscuits are the ultimate motivator for all dogs. Jasmine’s Favorite! Victoria’s lab, Sadie, will eat anything. So when determining the perfect recipe for her Positively Training Treats, Victoria relies on taste-tests by her relatively picky Chihuahua mix, Jasmine, to always tell her the truth… and she loves these! “You are what you eat” is especially true for our dogs, so be sure to treat yours to the highest quality food and treats you can find. Manufactured in the USA by Big Daddy Biscuits. Organic Garbanzo Flour, Organic Peanut Butter, Banana, Natural Apple Sauce, Cinnamon. 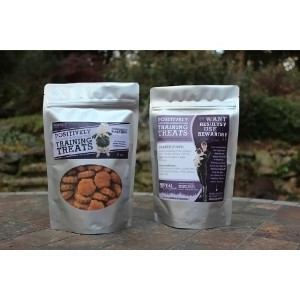 There aren't a lot of dog treats on the market, that are 100% natural, that my dog will eat. These are an exception. My dog loves these - she's learned what the bag looks like and is ready to work as soon as she sees it. On a side note, my cat loves them too.